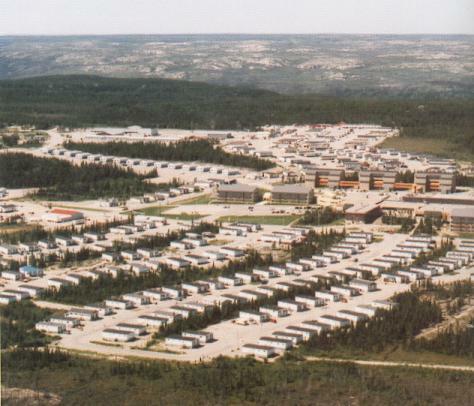 The village of Radisson, perched on a hill just before the very end of the James Bay Road, is about 5 Km to the north & west of the James Bay Road (Km 617). It has a population of about 500. Founded in 1974 to accommodate workers who worked on the Hydro Quebec James Bay Project, this is the only non Native community in Quebec north of the 53rd parallel. Over the years, the population of Radisson has fluctuated according to the needs of the large construction sites in the area. After the work was completed, some people, thus ensuring the survival of the young community. Located in the heart of the La Grande hydroelectric complex, Radisson offers a full range of services. Campground: lots of space, showers, no shelters, fee charged ($20). Robert Bourassa power station and dam tour. Free. English-speaking tours are available on special request. You may have to wait a day or two for a tour, so it's best to book ahead (say, from the Km 6 checkpoint on the James Bay Road or earlier). (819) 638-8486, 1-800-291-8486. For more info, see the Hydro-Quebec Project page. PLEASE NOTE: These tours have been cut back in scope thanks to a stunt whereby a journalist gained access to restricted areas and then publicized his actions. As a result the security consciousness kicked in and now the tours have been cut back. Thanks a lot, guy! Self-drive tour. You may explore most of the roads in the vicinity of the dam on your own. Any road you're not allowed on will be gated, so explore freely. If you are birdwatcher, check out the La Grande River where the water exits from the power station. Fish get sucked into the intakes of the power station and are often mangled (ie, injured or killed) during their passage through the generators. The gulls and terns love it! Not so great for the fish, though. Boat tours of the Robert Bourassa Reservoir. Robert A. Boyd Historical Site - a reconstruction of the first exploration camp. Across the La Grande River. (819) 638-6673. Not free. Tours in French only, I think. 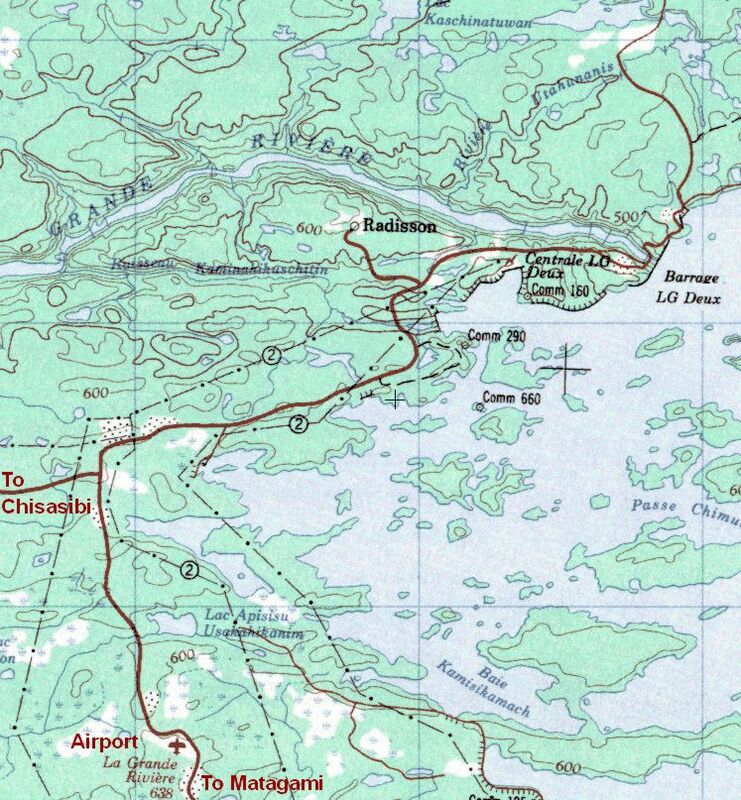 Visit Chisasibi, about 90 km to the west. There are some walking trails in the area. Ask at the Tourist Info building. When you arrive in town, you should definitely stop at the Tourist Information building. This is on the left as you come in to the main part of town. The staff there are extremely helpful, and are bilingual. They will help you with anything you want, such as booking a dam tour and accommodations, where to go in town, what to do, etc. They are open June 15 through Labour Day (first Monday in September). Phone (819) 638-8687. Email and website -- see above. There is one gas station in town. In August 2002 gas here was 86.9¢ per liter, and diesel was 79.9¢ per liter. Fuel is also available at the airport (see James Bay Road Guide). The gas station is also the only general store. Groceries, ice, and other items are available here. There is one other store in town, which sells mainly souvenir type stuff. Expect higher prices than you're used to, as all the stuff has to come up the James Bay Road. 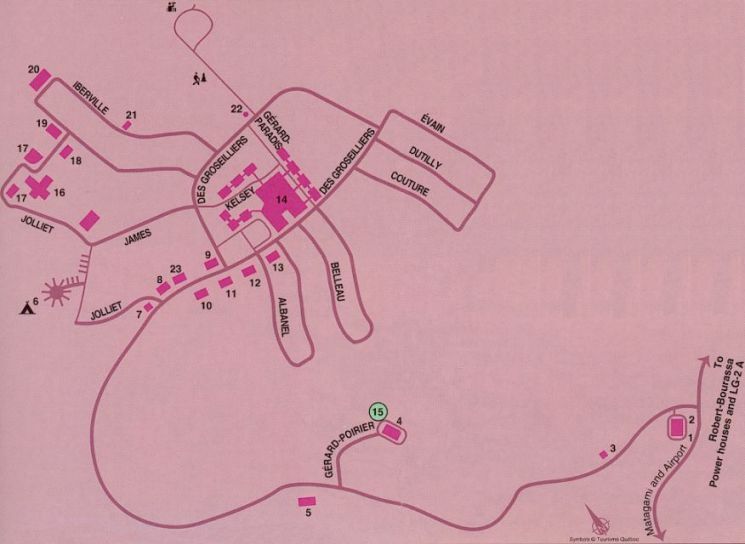 The campground is located just up the hill from the Tourist Information office. Turn left at the Tourist Info office, stop there to register for the campground, and then continue up the hill. The campground is spacious and clean. Washrooms, showers and water are available. There are 30 sites, 16 with electricity hookups. (819) 638-8687. There are other services available of course, but I've only listed the most commonly used ones. Inquire in Radisson for other services.